The treadmill comes with a 32-inch touchscreen to access on-demand classes. There's just something about spinning classes that inspires a level of cultish devotion in its followers, like the bond shared between the denizens of SoulCycle. Peloton is another such company, which launched a static bike that offered a live stream of classes from the company's New York fitness studio. Now, years after its initial 2013 launch, the company is branching out into a very different form of fitness: the treadmill. 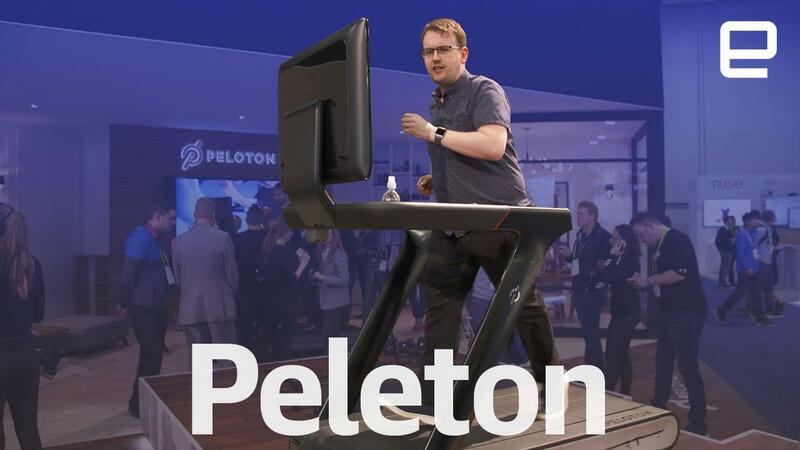 The Peloton Tread is a swanky, $3,995 treadmill that comes packing a 32-inch HD touchscreen for watching classes, both live and on-demand. It's better looking than most treadmills, too, and the speed/incline buttons have been replaced with chunky rubber knobs that offer far easier control. In addition, hit the center of each knob and you'll be able to increase your speed and incline by one whole integer without fuss. The belt itself comprises 59 aluminum slats coated in thick rubber that give the treadmill the feel of a springy dance-hall floor. It's surprisingly comfortable, and if you, like me, suffer from shin splints, then you'll notice a lack of discomfort when your feet strike the surface. Everything else, as you would expect from a Peloton product, is luxurious and well-designed, a league above what you'd see in a regular gym. Below the display is a 20-watt sound bar, but if you'd rather work with headphones, you can connect your Bluetooth set to the system. Those preferring to stick with a wired option can also jack in with the 3.5mm port. Both the speaker and the belt drive itself are covered in a nylon-blend fabric that makes the device look a little less intimidating should you have it in your living room. As well as that fairly sizable up-front cost, you'll also be spending $39.95 a month to get access to the on-demand and live fitness classes that Peloton is famous for. It means that you'll have to weigh up the pros and cons of subscribing to this over your own personal trainer, although if you're having that dilemma, you've got more money than pretty much everyone else.